I’m going to use this section of my site in an attempt to accomplish two goals. The first is to give you an idea of what’s happening in mobile. Not everything that’s happening in mobile: It’s a huge topic and there are plenty of sources for information on generic information, or specific to an industry. This is a site about publishing, and so I’m limiting my attention to mobile’s impact on publishing, mainly on book publishing. My contention is that publishers are grossly underestimating how important mobile is going to be to the future of their marketing efforts, and, to a somewhat lesser point (at least for now) to their content creation and delivery. When someone talks about “grossly overestimating” that’s usually hyperbole. And it’s of course inexact. Let me try it this way. What if 95% of your readers first heard about the next book they bought while reading something on their smartphone, perhaps reading on Facebook, Twitter or Pinterest? According to figures in my Mobile Strategies, by 2020 95% percent of Americans over the age of 13 years will own a smartphone. And as we now know just by talking a walk down the street, people don’t just buy smartphones the way they buy an extra TV set for the guestroom. They’re using their smartphones, constantly, compulsively, addictively, frighteningly. And this is how you need to begin to talk with your customers. I believe that mobile is creating rivals for publishing companies that the industry doesn’t accept — or perhaps doesn’t even perceive — as potential competition. Wattpad is the poster child for this new form of “disruptive technology.” It has 40 million monthly unique users, writers and readers. The publishing industry appears thusfar to believe that it can contain Wattpad merely by skimming off its most popular writers (easily identified via the site stats) and offer them some sort of “traditional” book publishing contract. Ah, if only it were so simple. 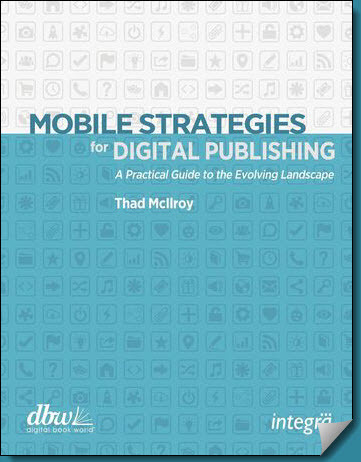 Here’s what I used to announce the publication of my new book on mobile publishing strategies. Press releases are pernicious sources of bloviation, so I tried to make it just short and sweet. For publishers, mobile is a foreign country. The inhabitants are shiny new devices, smartphones, tablets and e-readers — not to mention apps, the strange new beasts that live among them. Mobile is exploding faster than any communications technology that preceded it. Everywhere you look people are glued to their devices. Chances are they won’t come unglued anytime soon. And yet in many ways, “mobile” is a fiction. As publishers, authors, technologists and content creators, we make a mistake if we treat mobile as something wholly distinct from desktop computers. And we make another mistake when we treat it as separate from TV, gaming and music or video streaming. Mobile is intertwined with everything we do in digital entertainment—whether shopping, computing, communicating or just being social. Mobile is not a species. It’s an ecosphere. The challenges mobile presents can be tough to grasp because definitions are still evolving. The publishing industry is now adept at delivering content to mobile devices as ebooks. But mobile is not mainly about reading. For users, smartphones are primarily about texting and social networking and online gaming. Tablet users connect over similar software, while ultra-high-resolution screens make tablets perfect for watching movies and videos. Both smartphones and tablets feature digital cameras that can shoot still images and record video. One analyst estimates that total photo sharing across all social networks will be over 1 trillion images in 2014. It’s within this media mix that ebooks are ever more intimately situated. As a result, ebooks offer book publishers a modest but profitable toe in the water toward a mobile publishing future, at a time when sales of ebook may be approaching the limits of their growth. And while it’s uncertain just how much enhanced ebooks and apps will fuel the next phase in content sales, writing and reading still enjoy unprecedented popularity as mobile growth accelerates. The audience is out there. The challenge for book publishers is to align their content and business models with mobile’s vast opportunities. Below I’ve posted the first half of the book, up to Chapter 3. That will surely give you a good idea if you’d like the full book, in EPUB, Mobi or print. For publishers, mobile is a foreign country. The inhabitants are shiny new devices, smartphones, tablets and e-readers—not to mention apps, the strange new beasts that live among them. Mobile is exploding faster than any communications technology that preceded it. Everywhere you look people are glued to their devices. Chances are they won’t come unglued anytime soon. And yet in many ways, “mobile” is a fiction. As publishers, authors, technologists and content creators, we make a mistake if we treat mobile as something wholly distinct from desktop computers. And we make another mistake when we treat it as separate from TV, gaming and music or video streaming. Mobile is intertwined with everything we do in digital entertainment—whether shopping, computing, communicating or just being social. Mobile Strategies for Digital Publishing looks at each of the switches that can move the mobile dial within the digital publishing ecosystem. But just as often, this report will show when moving mobile switches also moves other mechanisms. After all, mobile is not a species. It’s an ecosphere. Consumers most often associate “mobile” with a smartphone/cell phone (54% selected this association), while only 14% said tablets/e-readers. 32% also said they associate mobile with ease of use on the go, demonstrating that consumers feel a strong link between that device in their pockets and the connected freedom it brings. In the modern era, book publishing has always competed for attention with other print and audio/visual media: newspapers and magazines; recorded music; radio; television; and feature films. But never has book publishing competed with these media on the exact same devices. The battle for attention, eyeballs and dollars has never been so intense. The publishing industry is now adept at delivering content to mobile devices as ebooks. But mobile is not mainly about reading. 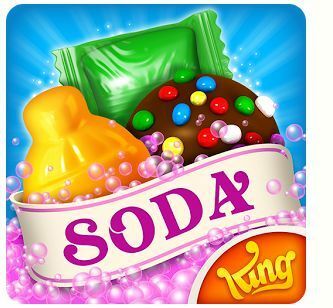 For users, smartphones are primarily about texting and social networking and online gaming. Tablet users connect over similar software, while ultra-high-resolution screens make tablets perfect for watching movies and videos. Both smartphones and tablets feature digital cameras that can shoot still images and record video. One analyst estimates that total photo sharing across all social networks will be over 1 trillion images in 2014. It’s within this media mix that ebooks are ever more intimately situated. As a result, ebooks offer book publishers a modest but profitable toe in the water toward a mobile publishing future, at a time when sales of ebook may be approaching the limits of their growth. And while it’s uncertain just how much enhanced ebooks and apps will fuel the next phase in content sales, writing and reading still enjoy unprecedented popularity as mobile growth accelerates. The audience is out there. The challenge for book publishers is to align their content and business models with mobile’s vast opportunities. The best way to visualize the opportunity in mobile is to return to the days before the World Wide Web. In the early ’90s getting online meant dialing directly into the network of a service like America Online (AOL). Network speeds were slow but easy access to email was the big draw. 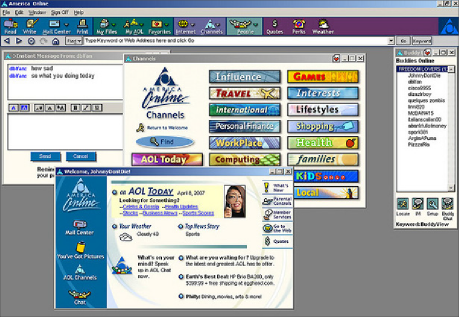 Over time, AOL added content “channels” to its network—content that AOL selected for its customers. In late 1994, Netscape introduced the first web browser, effectively breaking AOL’s closed-network model. Users now accessed the web without a gatekeeper. By the early 2000s fast broadband service at home turned web browsing into entertainment. Mobile, meanwhile, began as “cell phones” without web access. 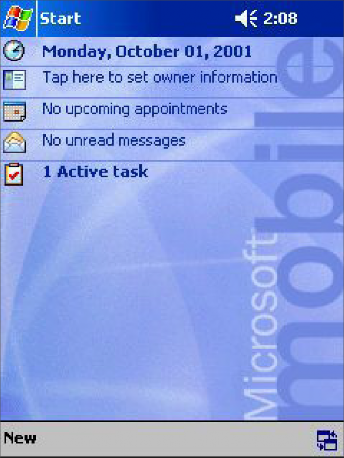 Sometime after the year 2000 Personal Digital Assistants (PDAs), most running Microsoft software, represented a big leap forward. Their operating systems controlled the user interface in ways similar to AOL’s early hold on PCs. The 2007 introduction of Apple’s iPhone ushered in the era of the smartphone. Touch screens replaced cursors and keyboards. Apps replaced the network interface. Built-in cameras snapped photos and recorded video that soon rivaled standalone digital cameras. Wifi provided low-cost network access. Social networking was ideally suited to these carry-along devices. And smartphones soon became location-aware, ushering in a new category of apps. Smartphones today have the same computing power as the PCs of 2005. 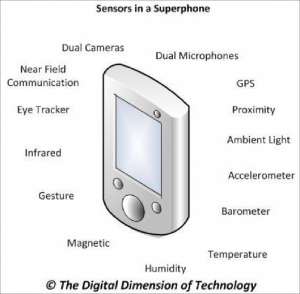 Multiple sensors are transforming smartphones into intelligent devices. By 2012, phone calls accounted for less than 10% smartphone use. 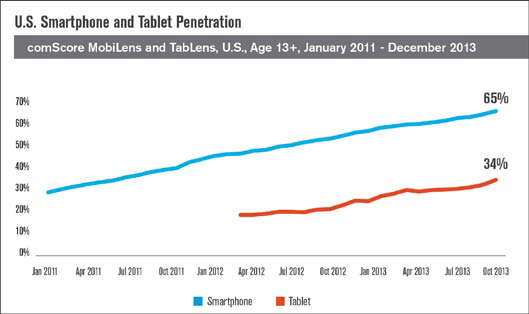 Tablets fill in the tightening space between smartphones and PCs. They’re squeezed from both sides. On one side are smartphones with oversized screens, so-called “phablets.” On the other side are notebook PCs, Chromebooks and tablet/keyboard combos. Despite their huge installed base, tablets sometimes look like transitional devices. The high contrast and low glare of black-and-white e-readers still make them the first choice for the most devoted bibliophiles. The attraction of tablets as e-readers stems mostly from their additional functionality, which is ideal for games and video. Web browsing works on tablets but feels crowded on smartphones, unless the site publisher offers a special smartphone-optimized version. 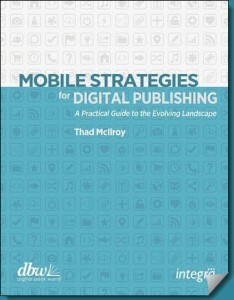 Mobile Strategies for Digital Publishing provides a snapshot of the fast-developing mobile landscape and the range of mobile strategies for book publishers. While this report’s title emphasizes digital publishing, the opportunities it explores also include the marketing and sale of print books via mobile devices. First, a few definitions and clarifications. Mobile Strategies for Digital Publishing classifies both smartphones and tablets as mobile devices. When discussing just one or the other, the term “smartphone” or “tablet” marks the distinction. “Cell phones” (also known as “feature phones”) crop up occasionally, indicating the generation of devices before smartphones, lacking touch screens and the wide range of smartphone apps. Ebook readers (e-readers) are also mobile media devices. They’re portable and connect to wireless networks. E-reader use has leveled off as those devices are supplanted by more versatile tablets. Still, they remain the No. 1 mobile device for ebook reading and buying. They are featured in the report wherever there’s data available and something noteworthy to say. The extent of the explosion in mobile technology has been thoroughly documented. Chapter 1 assembles the latest data on the depth and breadth of mobile’s growth, tying those statistics into current publishing industry trends in, and approaches to, mobile content and marketing. Chapters 2 and 3 focus on how content choices affect mobile strategies. Chapter 4 drills down to the tactical level of mobile marketing. Chapter 5 features case studies and examples of enhanced ebooks and apps. Mobile Strategies for Digital Publishing wraps up with a glimpse of what the future holds at the intersection of mobile and digital publishing (Chapter 6). Supplemental materials include a glossary and a list of additional resources. The report was written primarily for online publication. There are valuable hyperlinks throughout linking sources used by author in the research and writing of the report. The best way to understand the mobile opportunity is to absorb some of the data that defines today’s mobile market. Gathered here are more than thirty charts off a broad range of statistics and trends. Together they reveal how essential mobile is to publishing. There’s a breathless quality to many of the mobile industry’s reports, but taken together, a profile of the broader market opportunity takes shape. Most mobile data ignores dedicated e-readers. The section below, “Quantifying E-Reading Devices,” fills in the details. If you prefer to cut to the chase, the last section of this chapter, “What Do the Charts Tell Us?” summarizes the most important and the least expected lessons. 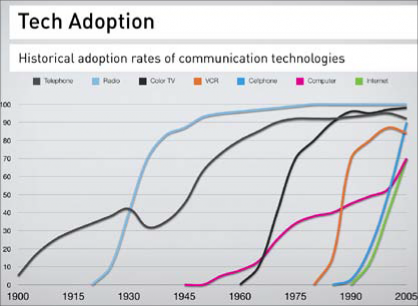 Cell phone adoption grew faster than did all the computer, communications and entertainment technologies that preceded it. An often-updated chart illustrates the relative adoption curves. Analyst Benedict Evans developed this chart comparing unit sales of PCs to sales of smartphones and tablets. 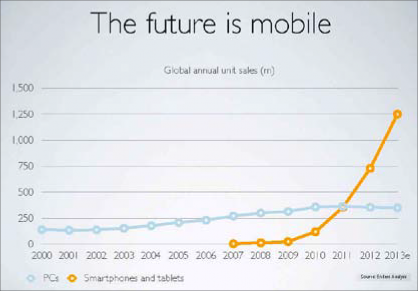 It shows that annual mobile unit sales overtook PC sales after 2011. 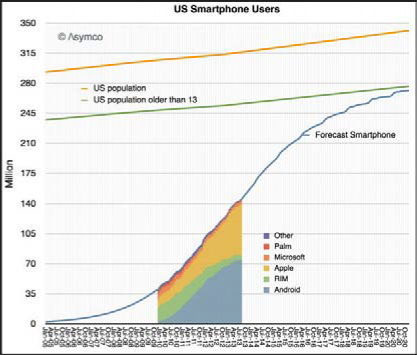 Asymco data indicates that there are now some 175 million smartphone users in the U.S. and that by the end of 2020 nearly 100% of people older than 13 will be using a smartphone. Tablet adoption has grown even faster than smartphones, although tablets are unlikely to reach the same market saturation; phones remain smaller, cheaper and more useful for a broader range of applications than tablets. ABI estimates that the installed base for tablets in the U.S. was 70 million units at the end of 2013. 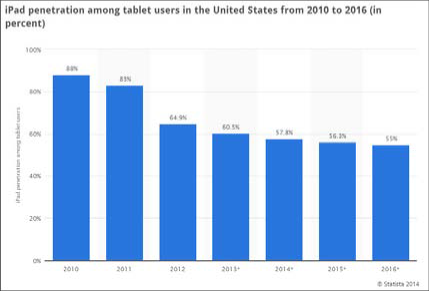 Smartphones have nearly twice the U.S. installed base as do tablets. Meanwhile, the loud explosion in tablet sales is growing quiet. Sales in “mature markets” were forecast to grow by just 3.1% in 2014. At issue for publishers is that it’s only the growth in sales that’s slowing. Apple will still ship some 55 million new iPads this year, and many of those will be heading to new customers, rather than serving as upgrades for existing iPad fans. 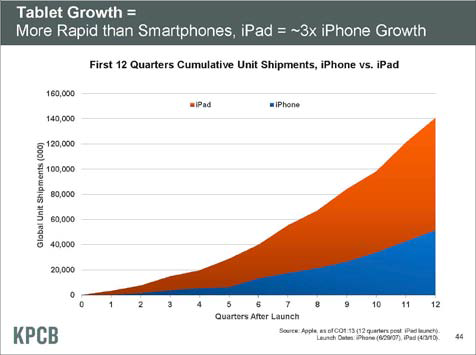 And so the iPad tablet opportunity remains large and still growing. Mobile adoption is exploding on both smartphones and tablets while PC sales growth slows. 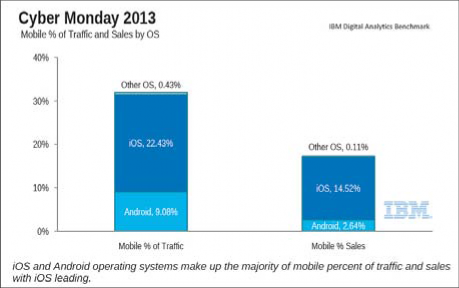 The charts below offer a more detailed look at the mobile opportunity. Mobile is not a single market. It is partly divided by the device— smartphones, tablets and e-readers. It’s divided again by the operating system of the major devices—Apple iOS or Google’s Android. (E-readers have much simpler proprietary operating software that’s not relevant to this discussion). 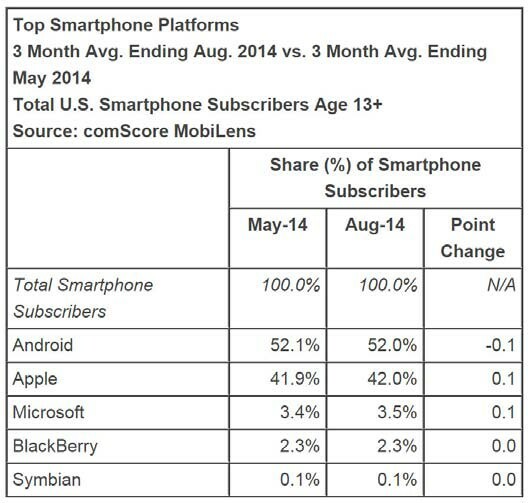 Many reports show that Android increasingly ranks as the top smartphone platform worldwide. iPad users are more engaged by their devices than other tablet users; in this respect, too, iPads dwarf the other players. Measured by the volume of web traffic driven by tablets, iPads accounted for over three-quarters of tablet use (U.S. and Canada). The behavior of Apple mobile users differ from Android users. 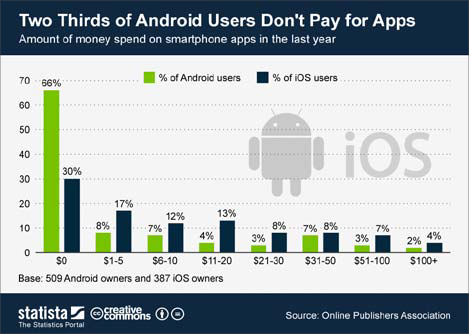 One consequence is that Apple devices command higher revenue per user than do Android. For instance, iPhone users are willing to pay a higher retail price for apps. Cyber Monday, the year’s top day for online shopping, accentuated the revenue gap in favor of Apple mobile users: last fall they spent five times more than Android mobile users. The revenue gap extended to money spent at retailers via smartphones and tablets. 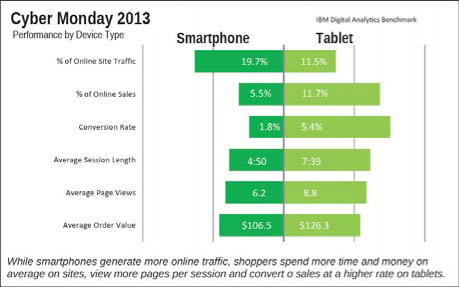 Smartphones generated more traffic but tablets drove more than double the percentage of sales. 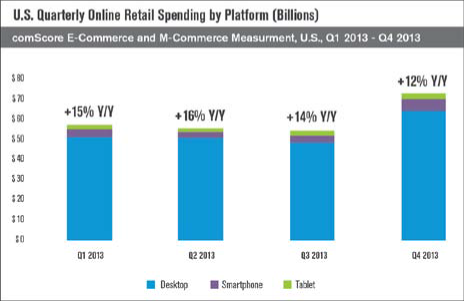 When measured more broadly, tablets have fallen behind smartphones for retail spending. 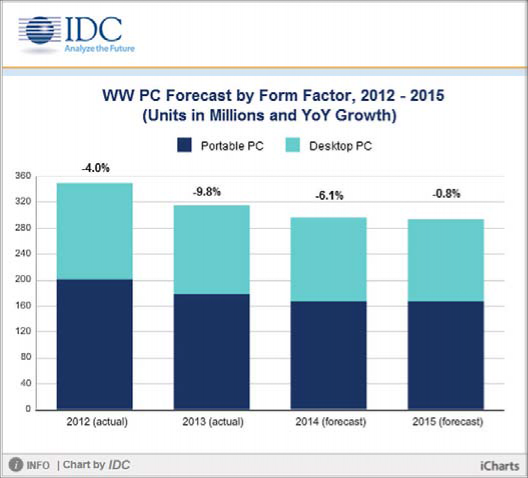 Regardless, PCs still dominate e-commerce by a large margin. Smartphones are far more plentiful than tablets, but a Monetate report shows that tablets drive 40% more web traffic than smartphones (while PCs still command nearly three-quarters of website visits). The charts above provide a glimpse into one of the most vexing challenges for app developers: Which are more important, Apple devices or Android ones? Android now wins the “total installed base” of smartphones contest while Apple continues to dominate the U.S. tablet market. Apple iOS users spend more on just about everything, from mobile apps to the online commerce mediated by those apps. But it’s foolhardy to focus exclusively on Apple mobile. 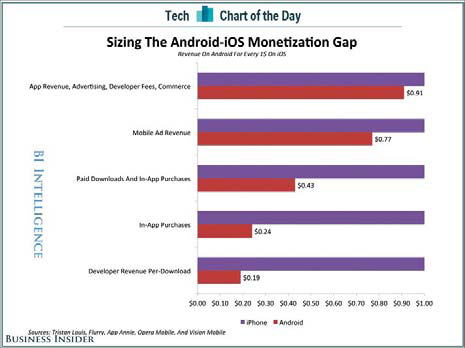 The gap is closing, and mainstream app developers now take Android as seriously as iOS. 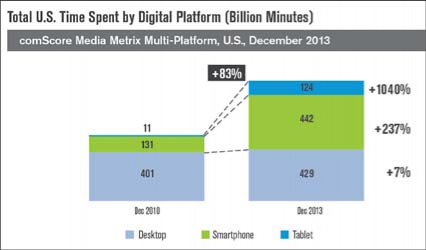 While tablets and smartphones are often lumped together into “mobile,” smartphone use is different from tablet use. The larger tablet displays make them better suited to visiting websites than do the small screen real estate on smartphones. Tablets are also the mobile platform driving big-ticket online sales but no longer comprise the bulk of mobile online sales volume. 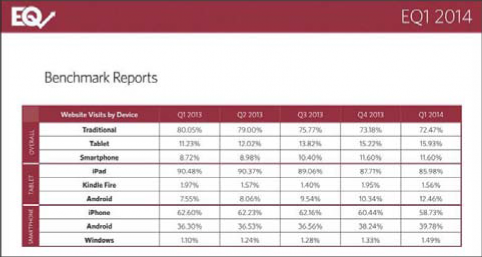 PCs continue to dwarf mobile online spend, commanding as much as 90% of the total. Life would be so much easier for publishers if mobile users still “surfed the web” rather than launching apps. 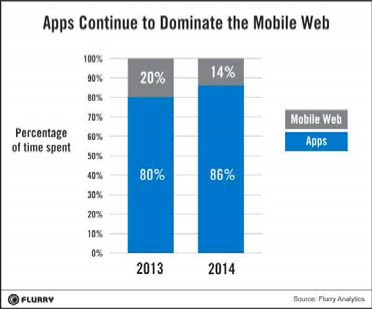 But apps maintain their mastery on mobile. In fact, apps gained six points in the percentage of mobile time spent over the last year. This puts to rest any question of whether publishers can create a sufficient mobile reach solely through their websites. It’s worth bearing in mind that the average adult spent two hours and twenty-one minutes per day on mobile devices (phones and tablets) in 2013. Mobile web use accounts for about a half-hour per day. That data is consistent with a separate study by the Donald W. Reynolds Journalism Institute (data for web use on tablets was essentially the same). Stuck behind gaming and social apps, entertainment (including publishing) plays a small role in the mobile universe. These charts from Nielsen’s February 2014 Digital Consumer Report illustrate how compelling social is for smartphone users. They also show that social media attention is garnered via apps— the second chart notes how little time is spent accessing social media via web browsers. 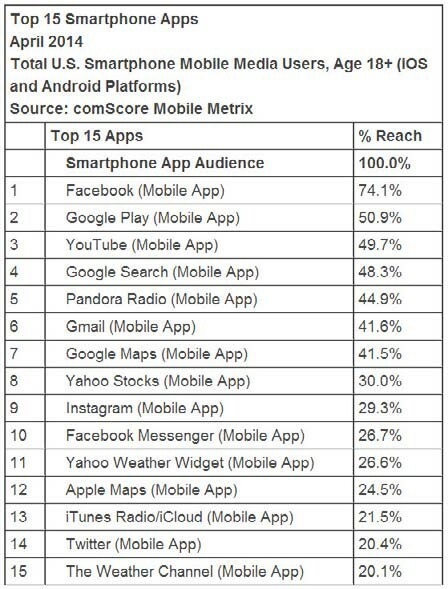 The chart below puts these numbers into perspective: The fifteen apps listed are used by between a fifth and three-quarters of all mobile users. The other 1,199,985 apps compete for users’ reduced attention. Another chart illustrates how rapidly Facebook users have shifted to mobile. In its first quarter financial report in 2014 Facebook anticipated that “mobile usage will continue to be the primary driver of our user growth for the foreseeable future and that usage through personal computers will decline worldwide, including in key markets such as the United States and other developed markets in Europe and Asia” (emphasis mine). It’s not just Facebook that’s moving to mobile. 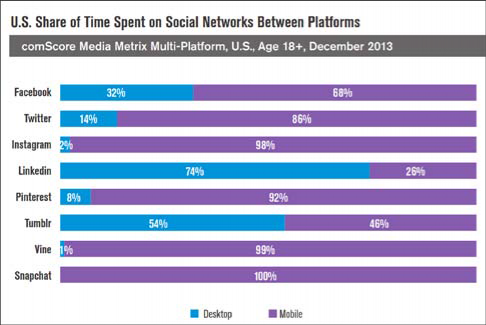 The chart below compares mobile-to-desktop use for all the major social networks. Only LinkedIn and Tumblr maintain more desktop than mobile users. Apps dominate the world of mobile and do so increasingly. Website visits account for only 14% of mobile time spent. A book publisher’s mobile strategy must include an app strategy. That doesn’t mean publishers must create apps. Interacting with mobile means reaching users through the most popular apps already in use, including Facebook, Twitter, Instagram and perhaps a dozen others. 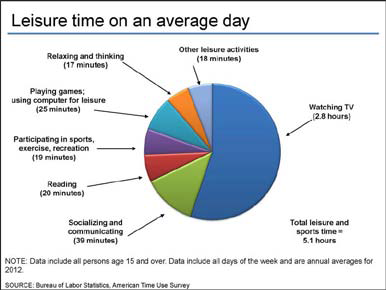 Google’s data indicates that people are spending an astonishing four-and-a-half hours of their daily leisure time in front of a screen. 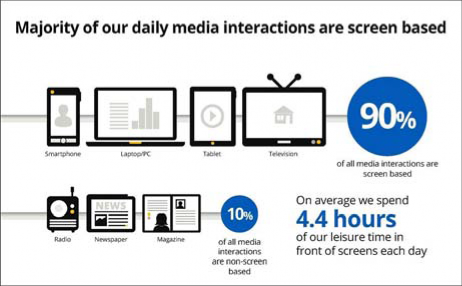 Only 10% of media encounters are non-screen-based, including both print and radio. ComScore uncovered a surprising phenomenon: time spent on mobile doesn’t appear to be taking away from PC use, and certainly not from TV watching. The time spent with mobile devices is incremental to other screen interactions. 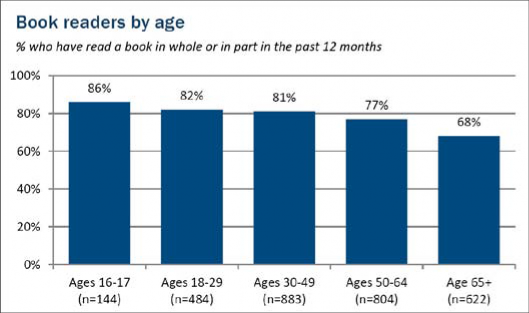 It remains to be seen whether 15–19 year-olds will morph into heavier readers as they age. This data might suggest that reading is on the way out, but the latest NEA (National Endowment for the Arts) data shows that over half of Americans (54.5%) read at least one book in 2012, down only slightly from the 56.6% recorded in its 2002 report. A Pew report included figures from polls going back to 1978. While the number of people who don’t read books increased, the 2011 Pew figures show that 49% of American read six or more books in the previous year. 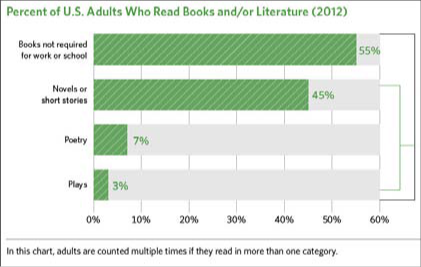 Enthusiasm for reading varies by race/ethnicity, income and level of education. Last year U.S. population growth dropped to 0.7%, the lowest level since the Great Depression. Population-growth demographic analysis shows that U.S. publishers can’t expect net new book readers to enter the market. Growth will come either from selling more books to existing readers or from international markets. Extrapolating from the Pew data suggests that those who read eleven or more books per year account for as many as 85% of total books sold. Another chart in the same 2012 survey shows that the youngest readers are at the head of the reading class. People still read. Lots. Young people in particular. But they do other things, like watch TV and play games, even more. The takeaway for mobile marketers is that online is the way to reach the most readers—or at least through a screen. 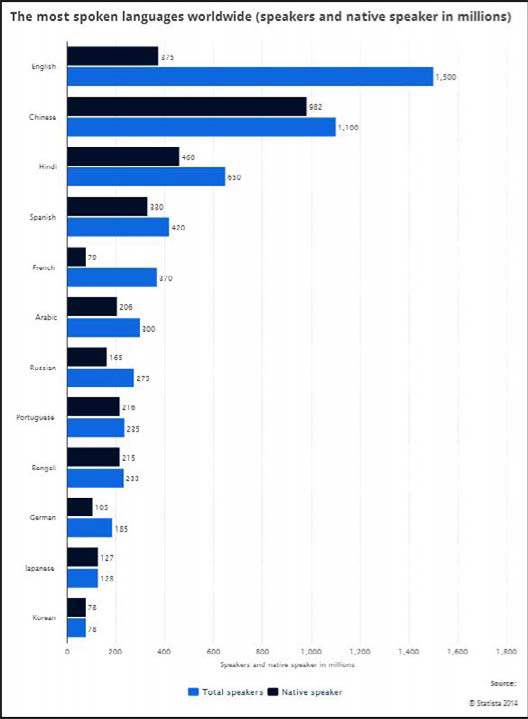 The chart below brings home an important point: North America is not the world leader in mobile subscriptions. But mobile subscriptions aren’t the most revealing metric. Language is more important, and English dominates across populations and across the publishing industry. English is spoken as a first language by around 375 million and as a second language by an additional 375 million speakers in the world. Around 750 million people speak English as a foreign language (where English is not spoken as a first or second language). One out of four of the world’s population speaks English to some level of competence, and demand from the other three-quarters is increasing. 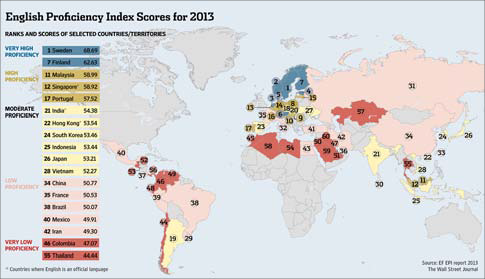 Data from the 2013 edition of Education First’s English Proficiency Index offers publishers a means to prioritize marketing of English publications based on each country’s degree of English proficiency. Publishers fearing a stagnating book market in the U.S. and UK can take heart that ebooks and e-commerce off access to an enormous worldwide market of English speakers and English learners. Pricing is an issue in many of the less developed countries. Mobile strategies must be international in scope. The largest channel for book buying—of digital and physical combined—is online. Bricks-and-mortar sales divide into six smaller channels. Measuring just ebook sales, estimates place Amazon at 65% of the U.S. market and 79% in the UK. According to George Packer, writing in the New Yorker, Apple and Barnes & Noble divide another 30% of U.S. ebook sales between them. This is probably a loose estimate. BISG data suggests lower market shares for both Apple and Barnes & Noble. 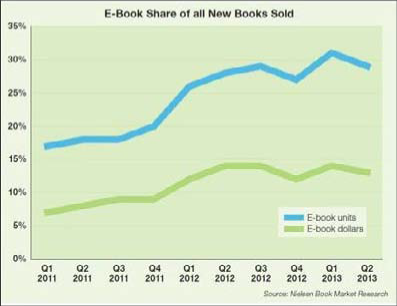 Ebooks command approximately 30% of books sold in the U.S., holding steady since mid-2013. Low ebook prices depress the dollar volume to less than half the unit volume. Book buying is now overwhelmingly online. It’s the choice of twice as many people as those who choose chain and independent retail bookstores. The focus for marketers must start with e-tailers, with Amazon chief among them. Amazon’s power is no secret, but the full extent of its book retail dominance can still surprise. Its strength in selling print books undermines both chain and retail bookstores directly. With two- thirds of the U.S. retail share for ebooks, there’s no clear No. 2 competing head-to-head with Amazon. The Amazon-Hachette dispute settled without a clear winner. Closer involvement and friendly cooperation with Amazon is the single most important tactic for a publisher to implement. Can any company refuse to devote full attention to its largest customer? As of this writing, U.S. ebook sales have been hovering between 25% and 30% of total book sales for over a year. Growth has stalled. No one knows whether a 30% ebook market share is the new norm. It may just signal a pause as ebook formats become more appealing, prices drop or digital rights management (DRM) disappears. 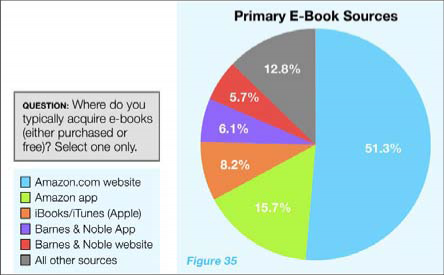 At BookExpo America (BEA) 2014 Nielsen released data on device ownership among U.S. book buyers. While the percentage of households with e-readers is declining, the two charts below demonstrate the ongoing importance of e-readers to publishers. 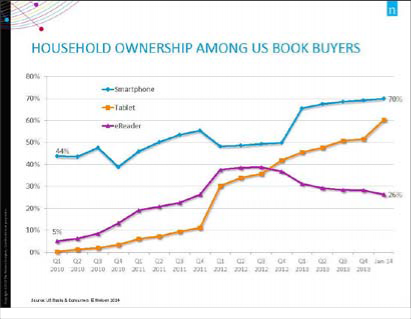 An October 2013 report from the Book Industry Study Group (BISG) off a slightly different view of device ownership among “adults who have said they read ebooks.” The chart below illustrates the split between ownership of e-readers and tablets. E-readers, both Amazon’s Kindle & Barnes & Noble’s NOOK, appear to total about 48% (vs. 26% in the Nielsen data above). 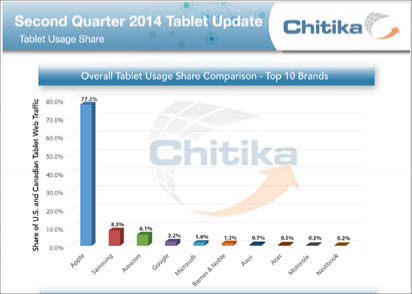 The five different tablets were owned between them by about 75% of respondents (vs. 60% in the Nielsen data). Tablets are the top mobile device for ebook purchases, followed closely by e-readers. Smartphones represent a small percentage of the total (online print purchases aren’t surveyed). In January 2014 the Pew Research Center’s Internet and American Life Project published a useful report, E-Reading Rises as Device Ownership Jumps. It broadly examines ebook readership as well as readership by device. The chart below compares the use of different devices specifically as e-readers. The responses are limited just to those who own each device. Owners of personal computers and cell phones use each of them frequently to read ebooks, roughly 10% of the time. Though twice as many book-buying households own tablets as own e-readers, the latter are nearly twice as popular for frequent ebook reading. Data from the RJI Mobile Media News Consumption Survey finds an average of 14% of smartphone owners use them to read books, versus 41% using tablets for reading, three times greater than on smartphones. Different devices engender different consumer behavior. For mobile marketing, the devil’s in the details. Tablets are increasing their hold while smartphones, although owned by 70% of readers, aren’t much used for ebook reading or ebook buying. Though now in a slow decline, the large installed base of dedicated e-readers (estimated at roughly 50 million in the U.S., and perhaps double that number worldwide) remains a top source for ebook purchases and reading. E-readers provide some degree of web access and some social features, but the major play for publishers to e-reader owners is selling lots of additional titles to these devoted book readers. Also important to keep in mind is that there are about twice as many smartphone owners as there are tablet owners. Some 95% of U.S. households own PCs. The total number of readers per device skews differently than the use frequency. Mobile has exploded—really exploded. There are 175 million smartphone users in the U.S.; 65% of the YA and adult population. Tablet ownership is roughly half that, at 34%. PCs remain more important than mobile devices for most uses (except ebook reading). But just about everyone owns a PC. In smartphones, the contest is between Apple and the various vendors of Android phones. 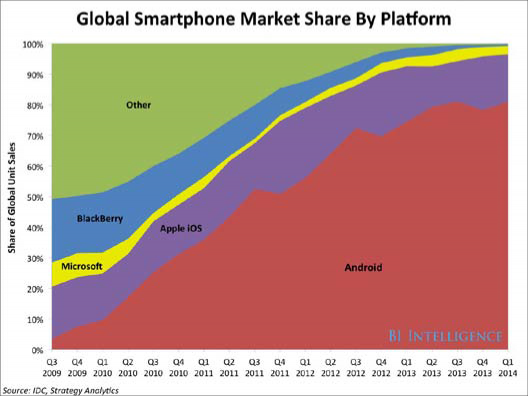 Android is quickly gaining market share, although iPhone owners are a devoted bunch. They’re not going away. In tablets, Apple continues to dominate the U.S. market. It has over half of the installed base. More importantly, iPad users use their tablets far longer each day than the competition. They also spend more, both on apps and for shopping. Tablets and smartphones are shopping machines, although as much as 90% of e-commerce originates on PCs. Mobile users favor apps over the mobile web, and by a large margin. Apple’s iOS and Google’s Android each offer 1.2 million different apps. A small handful of apps command the bulk of user engagement—gaming, social media and texting apps garner over half of users’ time. Still, the average mobile user spends as much as 30 minutes a day on the mobile web. 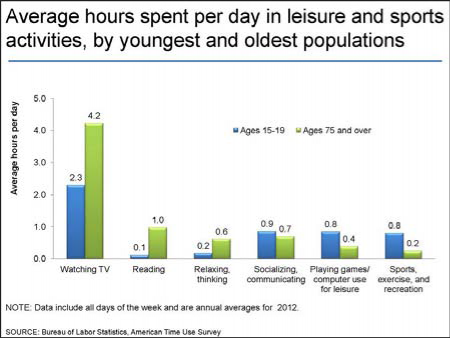 Watching TV remains the top leisure activity for the average American (2.8 hours per day). Despite all claims to the contrary, American are still readers and are reading as much as ever. Half of Americans read six or more books a year (and 5% read over 50 books a year). Heavy readers account for perhaps 85% of books sold. The heaviest readers may be the youngest. Publishers mostly underestimate the total English- speaking audience for their books. English is the first or second language for 750 million people and a foreign language for another 75 million. An even larger group, 2 billion, is learning English. Ebooks online make foreign customers more accessible than ever before, although U.S. ebook pricing leaves many books out of reach in less-developed countries. Nearly half of book buying originates online. 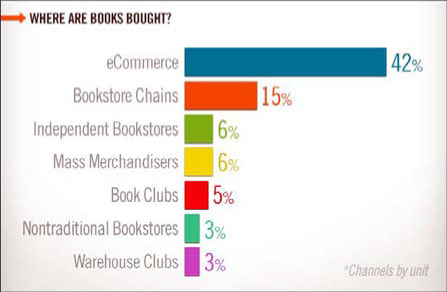 Chain and independent bookstores account for only half of that percentage. Ebook buying, upwards of 30% of unit sales, is (obviously) 100% online. Amazon has roughly two-thirds of the ebook market in the U.S. and four-fifths of the UK market. 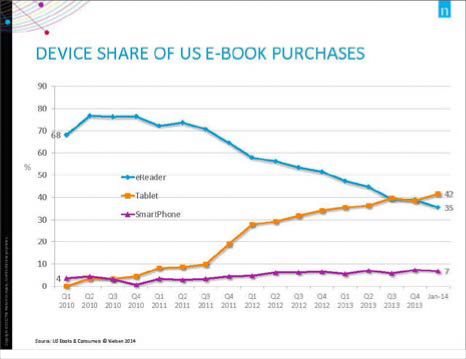 Book buyers own lots of smartphones, tablets and e-readers. 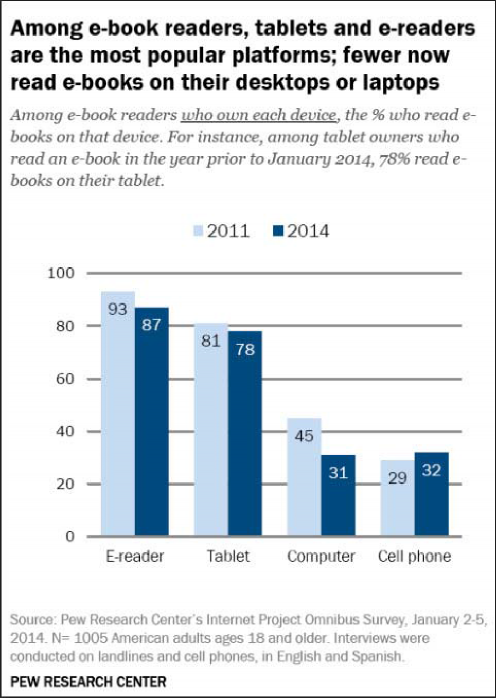 E-readers are used frequently by half of readers; tablets by a third; cell phones and PCs about 10% each. Another survey (which didn’t include e-readers) found that people were three times more likely to read a book on a tablet than on a smartphone. But e-readers remain one of the top sources for ebook purchases, tied with tablets. Content is the lynchpin of any publisher’s mobile strategy. The variety of mobile devices demands diﬀerent approaches to designing and formatting content. This chapter focuses just on the ways in which content inﬂuences a publisher’s mobile strategy. The following chapter, Chapter 3, Tools for Building Ebooks and Apps, adds technical details for selecting formats and showcasing content. Chapter 4, Mobile Marketing Strategies, drills down on marketing strategies and tactics. Inevitably, there is some overlap and these three chapters are closely intertwined. Publishing has traditionally treated the manuscript as sacrosanct and so built the print book “container” around an author’s words. Publishers follow the same path with ebooks, plus an extra step: they usually generate the ebook ﬁle directly from the Adobe InDesign ﬁle or the PDF used for the print version. There are obvious drawbacks to automatically calling on InDesign/ PDF ﬁles for ebooks. Too many ebooks have blank pages, half- title pages and copyright pages at the front of the book. It was a tradition in printed books, for legal and aesthetic reasons. Best practices today for ebooks call for moving publication and copyright information to the back of the book. Readers want to get right to the story. The print format path used to be so wonderfully simple. Start with hardcover. Then move to trade paperback or directly to mass-market paperback (or sometimes trade and then mass-market paperback). There were minor variations but few choices. The path has changed. Simultaneous hardcover and ebook publication is the default. The second choice, increasingly popular, is simultaneous trade paperback and ebook publication. It can be followed by a less expensive trade paperback (or a mass-market paperback for much genre ﬁction). A few years ago, publishers might stagger the ebook release for a month or more after the ﬁrst print edition. That’s rare these days. As of this writing none of the top twenty new print releases on Amazon lack for an e-book offering. Basic ebook: A simple ebook, with a modest number of ﬁxed-format This remains the publishing industry standard. Because most of these ebooks are read on dedicated e-readers, color highlights and color images are rendered in black and white. Enhanced ebook: A colorful ebook, enriched with a variety of video, audio and (some) interactive These don’t work well (or at all) on monochrome e-readers, but they shine on tablets (and sometimes on smartphones). Specialized enhanced ebooks are created with Apple’s iBooks Author software or Inkling’s Habitat. These programs arguably produce products closer to apps than to ebooks. They work on tablets and sometimes on smartphones. One vexing limitation is that ebooks created with iBooks Author can only be sold in the iBookstore. Book app: Rethink the book and turn it into an Doing it right is expensive and the revenue model mostly unproven (with the exception of a healthy children’s book market). This format works best on tablets and sometimes on smartphones. Publishers long ago learned to ﬁt content into the speciﬁc features and restraints of printed books. The range and ﬂexibility of digital formats offer publishers a new set of choices to showcase a book’s content. One approach is to ask, Who am I trying to reach, and what device(s) do they use? Data to help guide those decisions can be found in Chapter 1 of this report. For example, dedicated e-readers are still the No. 1 device for reading ebooks. Where possible, content should be optimized ﬁrst for their monochrome displays. Tablets, smartphones and PCs display full-color content. Apple iPads are more important than any other tablet brand, and Apple iPhones are more important than any other smartphone brand. Back in the spring of 2011, Evan Schnittman, at the time Bloomsbury’s director of sales and marketing, declared that enhanced ebooks were dead. “Enhanced will have an incredibly big future in education,” he said, “but the idea of innovation in the narrative reading process is just a non-starter. I’ve been smug about this, and now I’m even smugger.” Four years later, writing on Digital Book World, Peter Costanzo noted that, for a variety of reasons, Evan Schnittman was mostly right. This multi-megabyte title also illustrates a recurring problem of enhanced ebooks and apps: Adding video rapidly bloats the ﬁle size. Amazon charges authors 15¢ per megabyte against each customer ebook download. The charges for large ﬁles can exceed the revenue from the book. And customers become frustrated downloading large ﬁles to mobile devices. A broad rule for enhanced ebooks: high-profile titles can sometimes bring in incremental revenue through enhanced versions. For all others, caution is required. Can publishers convert print books into apps and ﬁnd new customers? Books are two-dimensional and static. Apps are multi-dimensional and interactive. Books gain little value when translated directly into an app. On the other hand, the market for children’s apps is now clearly established. Many are based on classic children’s books. And there’s a lot of innovation in the category. Many award-winning so-called “book apps” are mostly built from scratch. They resemble software more than they do books, and so demand the skills and the vision of software engineers and digital entrepreneurs. Publishers rely on “reader apps” to trigger multimedia, interactivity and other special properties built into enhanced ebooks. The The features of the Kindle reading app are well known. Third-party reader apps, like Calibre or Lexcycle Stanza, can be more ﬂexible and sometimes more powerful. The DRM built into paid ebooks makes it impossible to use these readers without illegally unlocking the ﬁle. Publishers mainly work within these DRM constraints. Kirkus is the most respected source of professional reviews of book apps. It’s Best Book Apps of 2013 records forty top apps reviewed in 2013. Tellingly, only seven target the adult market; the rest are kid’s books. The 2014 list includes ﬁve adult apps out of 25 total. It’s worth tracking Kirkus’s app reviews. A recent and positive review (for other than a children’s app) is Picasso: The Making of Cubism 1912–1914, developed by MoMA, The (New York) Museum of Modern Art. The review is largely positive for this $25 app (that weighs in at 750 megabytes). Publishers regularly scan best-seller lists to ﬁnd out what’s selling like hotcakes, what’s trending and what’s failing. The best- sellers lists for apps provide an equivalent value. Best-seller lists for books are subdivided by ﬁction/nonﬁction and hardbound/ paperback. App listings feature different divisions. 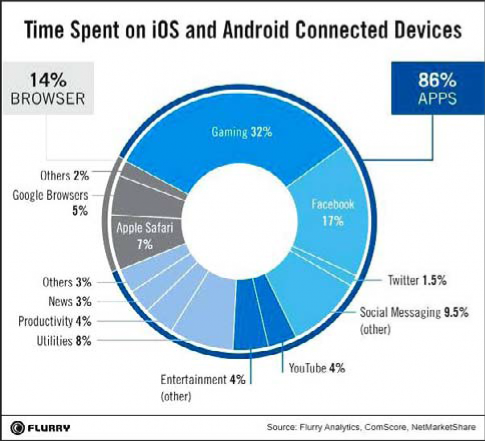 The two major platforms, iOS and Android, each have separate charts. Within each platform both free and paid apps are recorded. There’s not a book to be found in the top 100 free apps and top 100 paid apps on the Apple iTunes App Store. Games dominate. Likewise among the free apps and paid apps on Android. The most popular book apps on the iTunes App Store and the Google Play store are free religious books—versions of the Bible, the Quran, etc.—most offered in several languages. The next largest category are free ebook reader software. Brand names like Kindle and Kobo mingle with the more numerous third-party reader apps (such as the Aldiko Book Reader and the Moon+ Reader). Other popular categories are dictionaries (including the Online Cree Dictionary, with a 4.6/5 rating) and collections of free ebooks (such as Oodles’s 50,000 Free Ebooks and Reader). The most successful free apps are supported by third-party advertising within the app and/or by encouraging users to upgrade to a premium paid version. In the paid category on Android, standalone book titles enter the best-seller list, including Dr. Seuss books like The Cat in the Hat and Sandra Boynton’s popular titles such as The Going to Bed Book. Nearly all of the best-selling books are children’s titles. On a few inspirational and occult tiles also make the list. App Annie is the gold standard for app best-seller listings. Beyond the iOS/Android and free/paid charts, App Annie mines sales for Windows Phone and for Amazon as well as apps for Mac and Windows PCs. TopAppCharts has a homemade feel to its interface but provides a useful counterpoint to App Annie’s numbers. AppCrawlr: The App Discovery Engine provides a fast and easy way to discover book-related apps. Making the best choices for formatting and distributing digital content demands a comprehensive appreciation of devices, software and users. While EPUB remains the industry’s standards-based ebook format, e-tailers provide varying feature support. Publishers are challenged and users frustrated because the speciﬁcs constantly change. Apps are on track to being the most important way for publishers to interact with mobile users. This chapter introduced apps for publishing. The next chapter outlines the best approaches to building ebooks and apps, while the following chapter explores mobile marketing strategies. Delivering content in digital formats is still demanding for book publishers. Challenges persist both in file formats and in differing screen displays. Multiple file formats plague ebook delivery. While EPUB and Mobi are the two most popular formats, EPUB has two variants in use and Mobi has a successor format called Amazon KF8. Publishers are now comfortable creating just text-only ebooks. The degree of difficulty rises when images are added to the text, (and soon after with audio and video). Digital displays come in different sizes, aspect ratios and both in monochrome and in color. These challenges affect websites, ebooks, enhanced ebooks and apps, though each in different ways. The previous chapter described the market challenges surrounding enhanced ebooks. The opportunity for trade publishers of adult books remains slight, though some publishers have cracked the code. Enhanced ebooks exasperate digital publishers. There’s not even a widely accepted definition for the term. Broadly speaking, enhanced ebooks add audio, video and interactive features to a book’s text. But some publishers consider the addition of a bunch of photographs to be a defined enhancement. • An ebook created using the EPUB 3 standard, which supports audio, video, animation and interactive content. 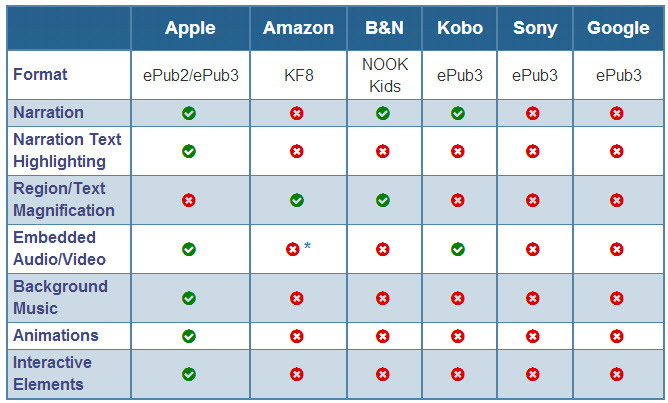 Most e-reading software has limited support for EPUB3 (see chart below). E-readers that accept EPUB3 files usually don’t support all of its file features. O’Reilly Media’s Sanders Kleinfeld provided a detailed analysis of the long-range opportunities inherent in the EPUB 3 format. • Amazon uses a different enhanced ebook standard called KF8, which is less robust than the EPUB 3 specification, forcing publishers to optimize their ebook files separately for sale on Amazon.com. • Ebooks created using Apple iBooks Author output to the Apple iBooks format — and can be sold only through Apple. • Apple has an iBooks Author Gallery illustrating the range of features available in the software. • Blurb specializes in illustrated books, primarily photo books. The company offers a simple PDF conversion tool to create enhanced ebooks for the Apple iBookstore (output as iBooks for iPad format). An Enhanced Ebook Gallery shows the range of titles created on Blurb. • Each title in the Inkling Store includes a free sample. The Habitat User Guide explains the ins and outs of creating Inkling ebooks. Very few book publishers develop apps in-house; most use contractors. Managing the many variables that go into designing and coding an app demands new skills, in fact a new team. And it’s a constant chore to keep an app up to date on two or more platforms (usually iOS and Android, but sometimes Windows and/or Blackberry as well). Some apps are targeted just for smartphones, others for tablets and some for both. Budgeting the initial cost of an app can be treacherous. Costs can range from $5,000 to $250,000 depending on an equally broad range of factors. Publishers have a hard time making these expensive decisions internally and so it’s essential to find an experienced contractor. They in turn select the app development agency and supervise the building and delivery of the product. Digital Book World published a detailed case study on app creation with a focus on children’s apps. The study describes how Wasabi Productions created “Lazy Larry Lizard,” its first app, and looks also at the development of “Gorilla Band,” its second app. Most publishers work with outside production partners rather than building ebook and app production skills in-house. Audio/video and interactive features demand skilled technicians. Here are some of the industry’s most respected production services. Some focus exclusively on ebook production while others can handle apps as well. URLs are linked to company names. From their website: “codeMantra is one of the leading providers of composition and conversion services, specializing in XML-first workflows for highly complex content creation, design, and distribution.” Global distribution services include automated distribution of files and metadata plus file validation and compliance. From their website: “eBook Architects, a service of Firebrand Technologies, works with authors and publishers of all sizes, designing high-quality ebooks for the Kindle, iPad, NOOK, and other devices. Our team develops the best in complex ebooks, including cookbooks, poetry, Bibles, textbooks, scientific and technical manuals, journals, chess manuals, and more. Integra is one of the leading digital content services companies providing content enrichment and learning transformation services to publishers and educational institutions while also providing workplace learning and development solutions for enterprises. Headquartered in Pondicherry, India, Integra has its global service delivery centers in India, Japan and the US besides providing project management & editorial support out of UK, Spain and Italy. Integra has been the principal sponsor of this report. For more information, visit www.integra.co.in. There are dozens of web-based services offering “free” app creation, often supplemented with premium-priced assistance for more complex apps. The price kicks in as a monthly fee for hosting the app, with most around $20–$100 per month. Still, these platforms provide a much lower-cost app build, and possibly an appropriately cautious way to launch an app publishing program. Here’s a selection of the tools and services available, chosen to provide a range of services while favoring lower-cost platforms. Appy Pie lets you build an Android app for free; apps for Apple’s iOS cost extra. For $19/month you can remove the “relevant” ads. The app building tools are drag and drop: no coding skills are required. Preview the HTML5 version of the app for this book here. From their website: “AppMakr is a do-it-yourself app creation platform that lets anyone make your own iPhone apps, Android apps and HTML5 mobile formatted websites—with no coding required.” The monthly cost is only $9. The company is now part of Infinite Monkeys, which claims that 12% of app developers use its software. Now owned by AppInstitute, an “App Builder for busy small business owners,” “Appsme (was) an easy-to-use website that enables anyone to build a mobile app for their business… It’s a simple 3-step process and the app will work on iPhones, Android phones and all other phones.” The cost to publish on all major platforms is $28 and up/month. Papertrell’s offering is specific to book publishing. From their website: “A scalable and cost effective solution for publishers to re-purpose books as apps… specifically designed to help publishers, writers and content owners to package books as interactive apps that run on multiple devices.” Pricing starts at $20/month. The company offers one-off services including design, conversion and marketing priced at between $500 and $1,000 per app. TheAppBuilder differentiates itself from the other app platforms not simply as the “world’s leading mobile app platform.” Their focus is “enterprise mobile apps” —they advise that their build-it-yourself tools are for “advanced users only.” For inexperienced app creators they offer to build the app for you. Pricing is not disclosed online. After raising nearly $100 million in venture capital funding App Annie certainly appears to be the market leader in app analytics. Its dashboard “helps you track all your app publisher data, across iTunes, Google Play & Amazon. One dashboard for all your app revenue, downloads, ratings, reviews & rankings.” There’s no cost except for an advanced “enterprise” edition. appFigures is a reporting platform for mobile app developers that brings together app store sales, ad data, worldwide reviews and hourly rank updates into an intuitive and informative reporting solution. Pricing is $9 per month plus $1.99 per app (the first five apps are free). Duda creates mobile sites interactively using your existing site structure via an online interactive previewer. Very impressive. Pricing is $9/month. Italicized words within a definition have a separate entry. For terms not included here please consult either http://mobileanhouraday.com/mobile-dictionary/ or the 53-page Mobile Marketing Industry Glossary (PDF), published by the Mobile Marketing Association. Android is Google’s native operating system for smartphones and tablets. Android’s underlying code is different from the code of Apple’s operating system, called iOS. As a result developers must write separate versions of their apps for each system. App is an abbreviation for “application.” Applications are the software, such as Microsoft Word or Adobe Photoshop, that runs on top of an OS. Apps refer to compact applications running on mobile devices. Apps are not as complex or powerful as applications because of the smaller screens for which they’re designed. They fill just a single function such as accessing Facebook or Twitter, playing a game or taking a photograph. Ebooks designate a digital file containing the contents of a book. Ebooks range from simple ASCII text-only version of a book, to a standard ebook format (EPUB or Mobi), to an enhanced ebook. Enhanced ebooks add audio, video and/or interactive features to a book’s text. EPUB is the industry-standard ebook format specified by the International Digital Publishing Forum (IDPF). While version 3.01 is the current version, most publishers still favor the simpler EPUB 2.0.1. Mobi is Amazon’s proprietary variant on EPUB 2.0.1, while Kindle Format 8 (KF8) is Amazon’s proprietary response to EPUB 3. E-readers are portable wireless devices optimized for read books primarily comprised of text. Most e-readers use E Ink’s black-and-white electronic paper technology. Apple’s native mobile operating system. See also Android. The most important measure of user engagement in the mobile space is the ratio of DAU:MAU, the Daily Active User(s): Monthly Active User(s). If an app is gaining traction the DAU will be larger than the MAU. Many experts rate an app as successful with a .2 ratio. Mobile refers to the broad ecosystem of mobile devices, operating systems, apps and mobile users that are redefining the communication technology industry. A mobile device is a lightweight wireless phone, tablet or e-reader built for portability. Mobile devices let users make calls and send text messages, browse the web, read ebooks, view video and listen to audio, and to use any of over 1 million free and paid apps. OS is an abbreviation for operating system, the software that forms the underpinning for applications (on PCs) and apps (on mobile devices). The most popular mobile OSs are iOS (for Apple mobile devices) and Android (Google’s mobile OS), used on most other mobile devices. Personal Computers (PCs) appear in three forms: desktop PCs (stationary devices), portable PCs (carry them with you) and notebook PCs (small portable PCs). (Tablets are often called tablet PCs; in this instance the term tablet is more important than the term PC.) 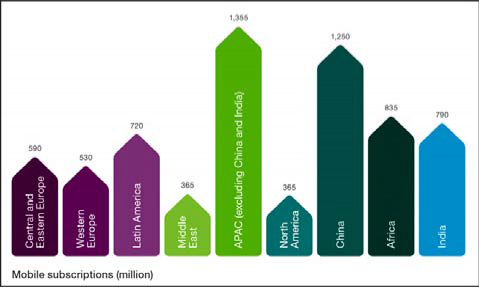 While mobile is now the faster-growing market, there are already over 1.5 billion PCs in use worldwide. A phablet is a handset with a screen size between 5 and 7 inches. Phablets are crossover devices functioning both as phones and tablets. 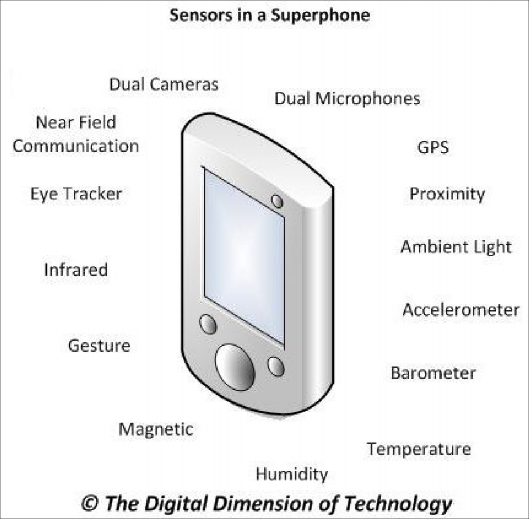 All smartphones are cell phones, in that they connect to the phone network not with wires but through a series of radio transmitters. While cell phones might have just a text interface, smartphones use high-resolution touch screens and offer a wide range of apps through an online store. Cell phones are often called feature phones. A tablet PC is a mobile computer with a high-resolution touch screen as the input device. Screen sizes usually range between 7 and 10 inches. While they can function for general computing tasks (often with optional keyboards), tablets are most often used for media consumption, in particular video and games. Web apps run in web browsers rather than as small standalone software programs. As such they’re best suited to PCs and tablets; smartphones aren’t optimal for web display. Bubblewrap is a simple game app that runs on Google’s Chrome browser. 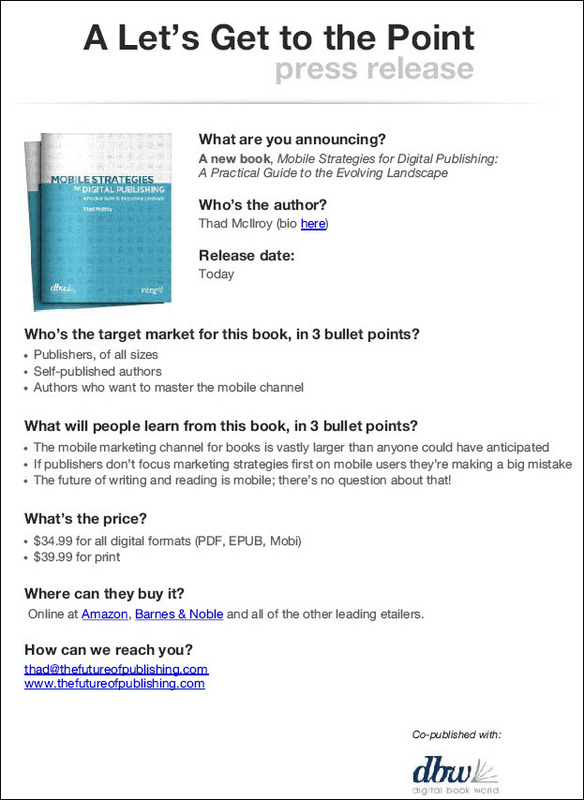 That’s it for excerpts from my book/report Mobile Strategies for Digital Publishing. It’s available both as an ebook, and, by popular demand, in print.